Having never read any of Mhairi's books, I was drawn to request it on Netgalley simply because of the name and cover art. I thought the cover was a step above your average rom com cover, I liked the pop of colour and the simplicity of it. So, the name...maybe not the most inventive name, but coincidentally the same title of the book written by Jon Richardson, my all time favourite comedian, so it's fair to say that it called out to me, I couldn't resist. Also, Mhairi and I seem to have one thing in common and that is an impossibly spelt Scottish name. I was blessed with the name Eilidh (Ay-lee) and have since spent my life correcting peoples pronunciation, and if thats not reason enough to read a book, then what is? Regardless of the reasons I decided to read it, I can tell you now, that I am glad I did because I loved it! Delia is 30 something, living a comfortable life with boyfriend Paul and dog Parsnip, whilst spending her days working for the council. It's not exactly full of passion or adventure, but it's comfortable, and Delia is ready to settle down. But as she takes it upon herself to propose to boyfriend, Paul, a secret comes to the surface. It seems that Paul hasn't remained entirely faithful to her and Delia has to decide whether to forgive him or leave. Delia runs off to London, moving in with best friend Emma, taking up a job with the sleazy Kurt Spicer and she begins to create a new but somewhat temporary life for herself. The book follows Delia as she finds her feet in London. We see her friendship with internet troll and computer whizz 'Peshawari Naan' grow and witness her come to blows with enigmatic journalist Adam West. But, will she come to forgive Paul or will she find something in London that is worth letting go of such a large chunk of her past. 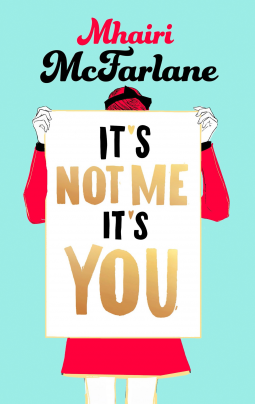 It's Not Me, It's You has a plot reminiscent of many chick lit or rom com's; girl is content with life, boy cheats on girl, girl runs off to london, boy tries to win girl back, girl falls in love. In the basic plot there is nothing that seems to stand out. Yet as I finished the last page, I found that the story had stuck with me in a way that many chick lits fail to. Where Mhairi's strengths lie are in her creation of characters, Delia is funny, strong, creative and exactly the type of girl you can imagine having a good chat with. Her characters were so normal and relatable as well as being quirky and witty and because of that brilliant combination, they were perfect. Delia was most definitely my kind of character, she had a dress sense I could relate to, none of this thigh skimming silk dress nonsense, she is a female character written for women. In fact, I can imagine her now, dressed in a colourful, patterned tea dress, with a beautiful pair of heels, razor sharp winged eyeliner and a mass of fire red hair. The description was vivid and tasteful, making Delia the sort of girl you come easily bump into in the street, the sort of girl you want to be friends with. I felt that there were some brilliant relationships in the story. I really enjoyed the relationship between Delia and her brother Ralph, who spent his days working in the local chip shop or gaming. There was a lovely understanding between the two of them, Delia was sensitive to his needs and equally Ralph was incredibly supportive of her creative ventures. Another relationship I particularly enjoyed was that of Delia and 'Peshwari Naan', it was somewhat refreshing to have a platonic relationship between a boy and girl which is sadly so rare in this genre of writing. And, of course, I can't not mention Adam West, I really enjoyed his development as a character and his relationship with Delia. Adam West, the handsome journalist who is snooping around for the dirt on Kirk Spicer, he has all the girls swooning, but not Delia, she is sure not going to fall her him. But as she starts to become aware of Spicer's dirty ways, she can't help but find herself siding with sworn enemy, Adam. The book was littered with humour and it had me biting my cheeks so that I didn't burst into bouts of giggles on the bus as I read it. But, it wasn't forced humour, it was natural and authentic and I enjoyed it all the more for it. Occasionally I would come across a sentence that would catch of off guard, Mhairi evidently has a very strong and distinctive sense of humour that she has managed to channel through Delia so well. There was a reference to Tenacious D, which I found myself having to reread, having had my eyes opened to the world of Jack Black and his...interesting music by my brother, I was somewhat surprised to find it being mentioned in what I had assumed to be no more than a cushy rom com. Now that I have come to the end of my first foray into the world of Mhairi McFarlane, I have only been left wanting more and I will most definitely be exploring her other offerings. So, if you have not already picked this book up, then I urge you to. It reads easily and you will devour it in no time at all!